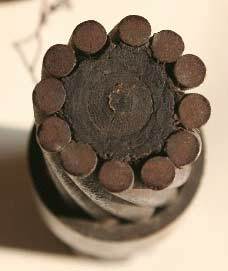 Introduction: Patricia Howe has kindly provided photographs of some early cable samples which came down in her family from E.J. Reid, grandson of one of the earliest telegraph engineers, William Reid. Thanks also to Steve Roberts for his research contributions to this article, and to Texas MacDonald for the photographs of his Reid Brothers blasting box. See also John Liffen‘s 2013 article on Telegraphy and Telephones, which has a detailed section on Reid Brothers. Edwin James Reid, J.P., was my great uncle. 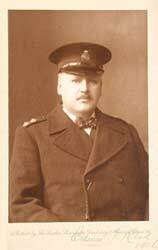 He was the son of William Reid, telegraphic engineer, and the grandson of William Reid, one of the pioneers of telegraphy, who founded the business of Reid Bros., London, and laid the first submarine cables across the English Channel from Dover to Cape Griznez. E.J. Reid became a partner in the firm in 1895. As he and his wife had no children of their own they brought up my mother’s elder sister, Edith Macaulay. 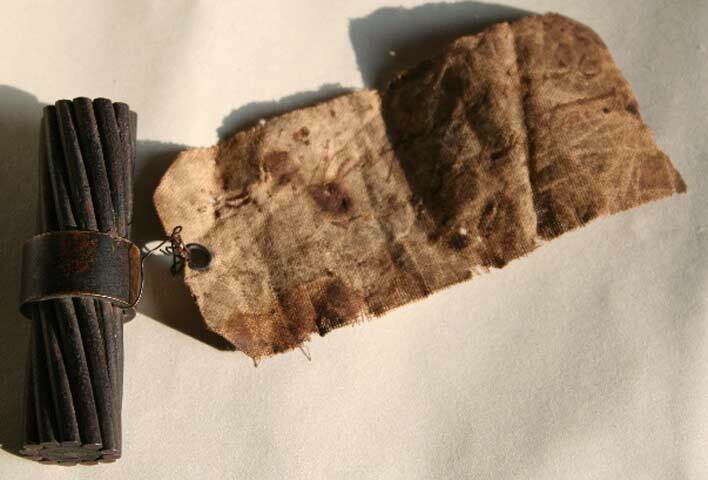 When she died I inherited a piece of the Newfoundland/Cape Breton cable (with label still attached), plus a thick (3cm diameter) piece of cable and another piece of steel cable in a small lined leather case. I remember being told as a child that one of them was part of the first transatlantic cable. William Reid & Company, 25 University Street, London, makers of scientific instruments from 1820, who became telegraph engineers, manufacturers of telegraph instruments, underground troughs, and so forth, in 1836—the oldest telegraphic engineering firm, and one of the largest such, in Britain. The firm was founded by William Reid, senior (Member of the Institution of Civil Engineers, Member of the Royal Institution and Fellow of the Royal Geographical Society), who was born in Glasgow, Scotland, in 1798. His workshops manufactured the initial commercial instruments for W F Cooke and Charles Wheatstone, subsequently providing equipment for the Electric, European, Submarine, Magnetic and other telegraph companies in Britain. 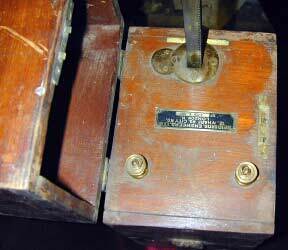 Reid also manufactured electric clocks and chemical telegraphs to Alexander Bain’s patents. The firm had become Reid Brothers by 1861, comprising William Jnr, James and Robert Nichol Reid. 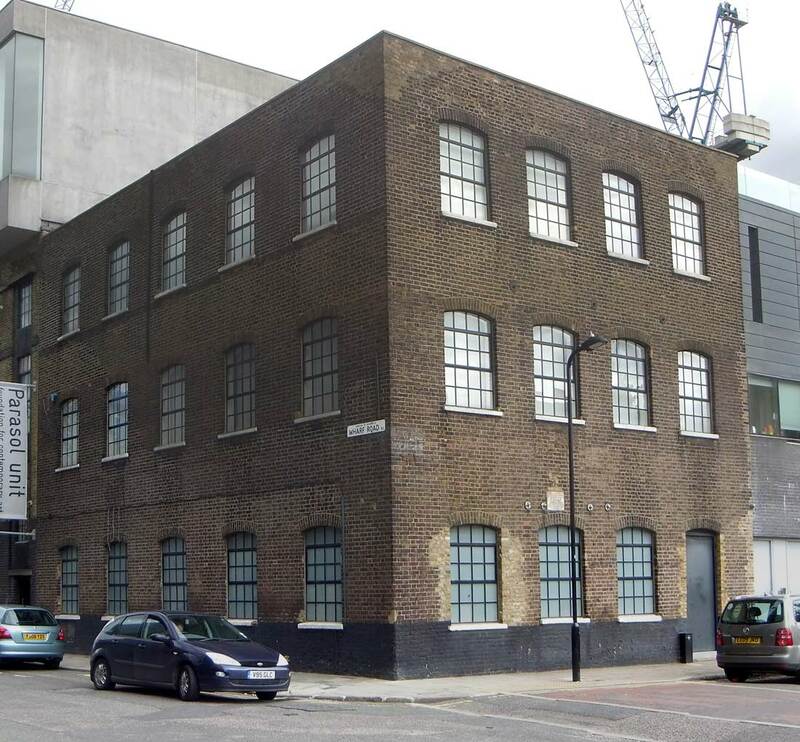 In 1862 the company also had premises at 3, 11, 13 & 14 Thornhaugh Mews, Tottenham Court Road, and “Standard Factory”, 12 Wharf Road, City Road. 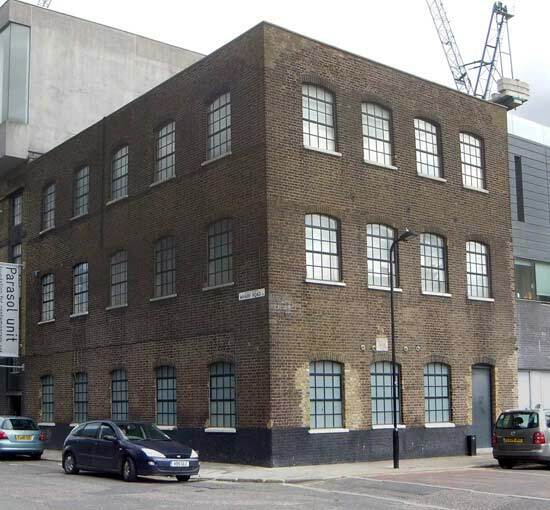 The business had concentrated at 12 Wharf Road, City Road, London by 1867. 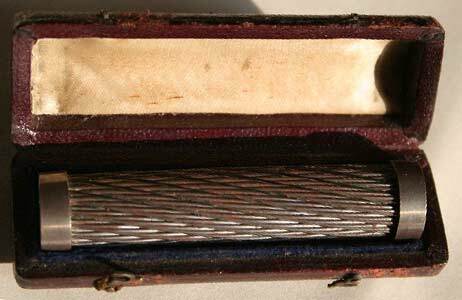 The firm possessed a remarkable collection of some of the earliest telegraphic instruments which, by implication, they had made. 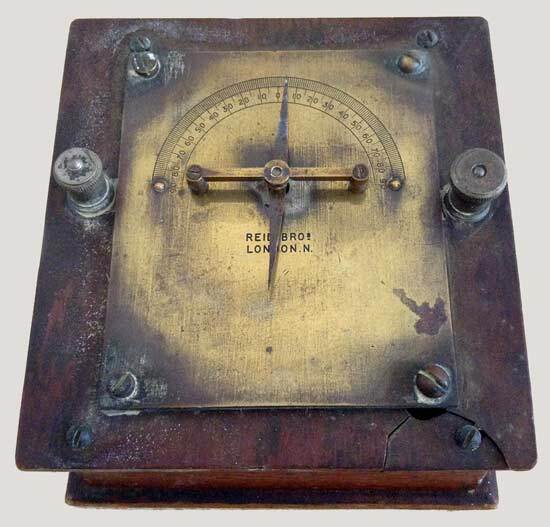 These included Bain’s electric clock 1845, Cooke & Wheatstone’s original two-needle telegraph 1843, Cooke & Wheatstone’s original one-needle telegraph 1846, Nott & Gamble’s dial telegraph 1846, Wheatstone’s magneto & bell machine 1840 and Wheatstone’s dial telegraph 1840. 262, Gresham House, Old Broad-street, Sept. 2,1861. 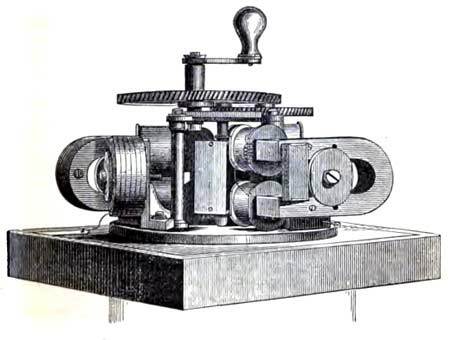 William Reid worked on the 1850 Channel cable and the 1853 Anglo-Irish Cable, among others, and made cable-testing tanks for the Gutta Percha Works. He also supplied troughs and conduits for landlines in the early 1850s, and conducted tests on the 1857 Atlantic cable during its manufacture at Birkenhead and Greenwich. For the 1850 Channel cable, which was unarmoured and thus too light to sink to the bottom, Reid supplied lead weights to be attached to the cable every sixteenth of a nautical mile. 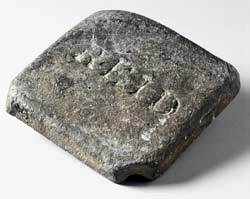 The weights, flat rectangular blocks of lead weighing either eight or sixteen pounds, were made in two grooved halves which were pressed together over the cable and clamped with studs. The weights were applied to the cable as it was being paid out, the operation being interrupted for the fastening of each pair of weights. Remarkably, the cable survived this treatment, although it failed shortly after being laid. 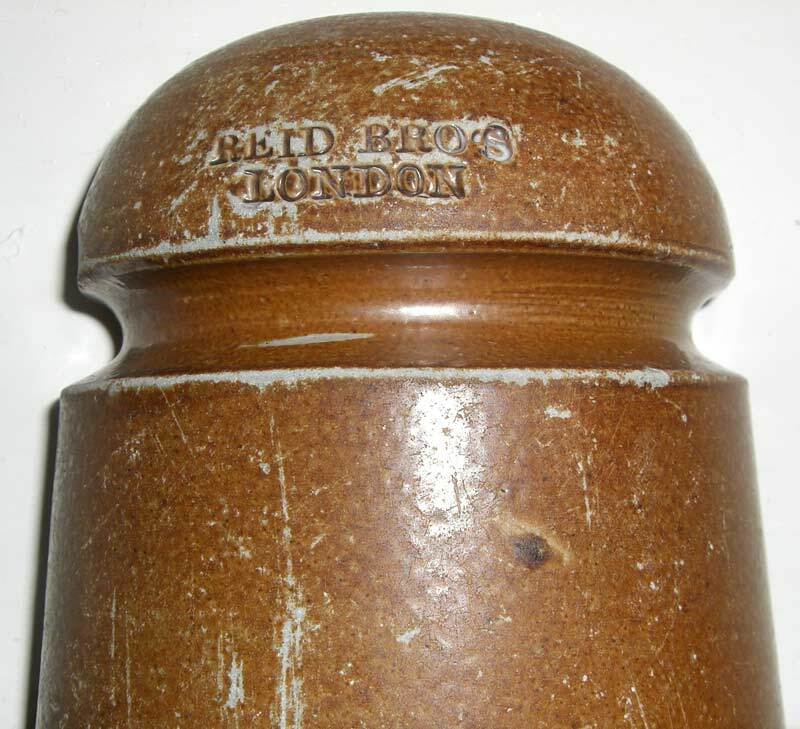 An unused example of a lead weight, marked Reid, made by Reid Brothers, Islington, London, England, 1850. 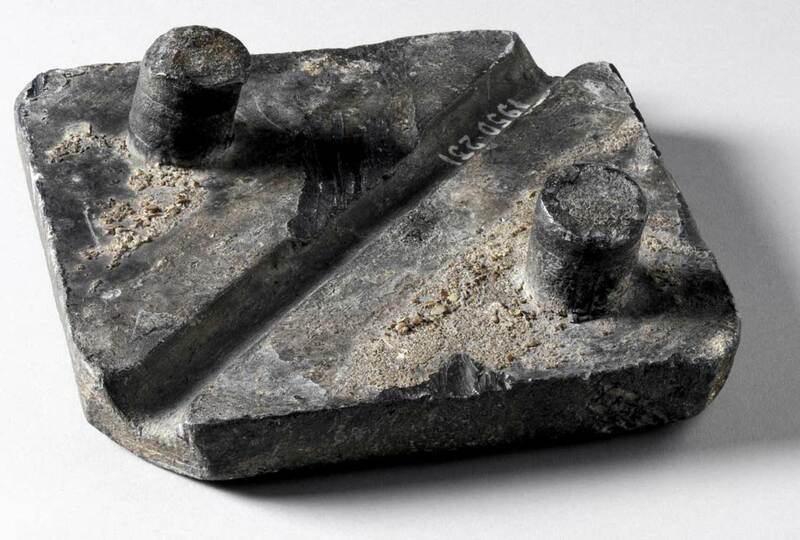 Pairs of these weights were clamped to the cable at intervals of 100 yards (91.4 m) to ensure that it sank to the seabed. Images courtesy of Science Museum - Information Age. William Reid Senior lived at 63 Adelaide Road, Hampstead, London NW during the 1850s and 1860s with Mrs Matilda Reid and daughters Hannah and Jane. As William Reid, “engineer and machinist”, he started off as a philosophical instrument maker in the 1830s or earlier at 25 University Street, Tottenham Court Road, London. By 1856 the firm was called Reid Brothers, telegraph instrument makers, at the same address. William was still about in the 1860s, long after the firm had become Reid Brothers, comprising William Junior, James and Robert Nichol Reid. 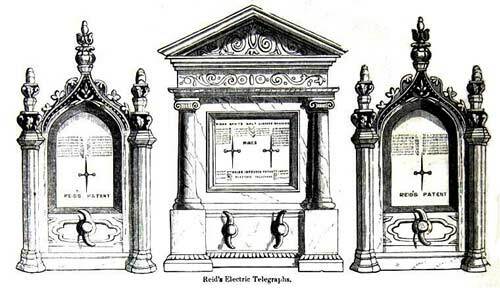 ELECTRIC TELEGRAPHS.—REID, Brothers, 25 University-street London, machinists and telegraph engineers, respectfully give notice to telegraph and railway companies in this country and on the continent, that they have succeeded to the business of their Father, and continue to PREPARE and CONSTRUCT TELEGRAPHS, and guarantee the perfect working of the same. They have on hand a large and varied assortment of telegraph instruments for railway and commercial use, factories, coal mines, and domestic purposes. 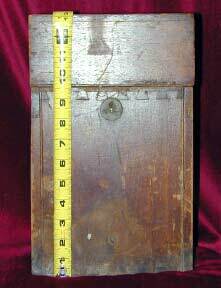 They would also call particular attention to their simple and cheap electric telegraph instrument for the use of the lecture table and public seminaries, by which the principle of this wonder-working agent may be explained and understood. They have always in stock a large assortment of telegraph wire in copper and iron, also covered with gutta percha. Iron and wood troughs, for underground telegraphs, of the best form and construction. 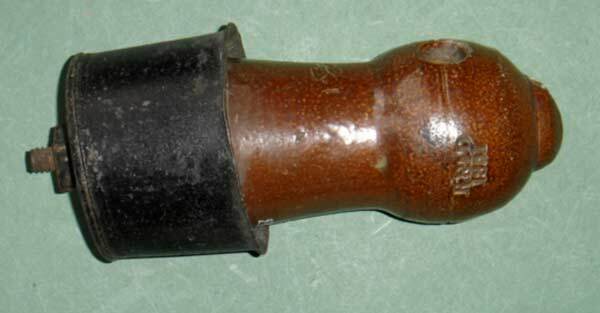 Specimen of submarine cables, according to Reid’s original invention of 1850, and as laid across the Channel from Dover to Calais, Belgium, &c. Patterns of the best and most approved insulators in glass, china, and earthenware. Galvanic batteries in various forms, and on the most approved principles; also Reid’s patent glass troughs, consisting of 12 cells in one piece of glass. Tenders given and contracts entered into for the erection and maintenance of submarine, subterranean, and pole telegraphs. The overhead wires and submarine cables for the West Highland Telegraph’s Cantyre lines were all constructed during 1864 and 1865 by Reid Brothers, telegraph engineers and contractors, of University Street, London. 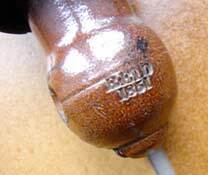 In 1865 Reid Brothers laid cables in Scotland for the Universal Private Telegraph Company. Damaged landline insulator marked “Reid Bros London”, found in the sand on the beach at low tide at Ardmore Point, near Helensburgh, Scotland, by site visitor Joyce Garson. Helensburgh was on the West Highland Telegraph’s Cantyre lines, which were constructed by Reid Brothers. The Universal Private Telegraph Company kept its stock of instruments and equipment at Wharf Road. Passing along the collection sent by Her Majesty’s Postmaster-General, the attention is arrested by two large double-needle instruments in heavy mahogany cases, bearing brass inscription plates at their base. Reid Brothers, 12 Wharf Road, London, N.
Sole proprietors of Heaviside’s patent wire for the prevention of induction in telepone circuits both in underground and suspended wires. Sole licensees for Creighton’s patent insulator for fixing wires without the use or aid of binding wire. The Times issue of 22 December 1908 carried the obituary of Robert Nicol Reed: “of Camden-road, N.W., and of Messrs. Reid Brothers, telegraph and pneumatic engineers and contractors and instrument manufacturers, of Wharf-road, City-Road, N., who died on November 4th”. One of the innovatory products made by Reid Brothers was the “Magnetic Exploder”, the first electrical machine for detonating explosives from a distance. 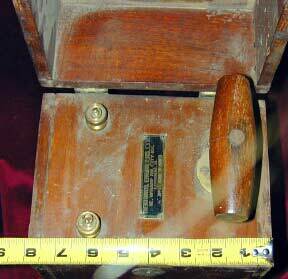 It was invented by Charles Wheatstone in 1860 and included in his patent No 2,462 of that year. 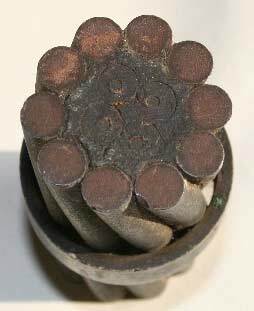 The Exploder was used in concert with an insulated copper wire and Frederick Abel’s “Magnet Fuze”, which was a tiny charge of ‘phosphide of copper’ in a gutta-percha casing ignited by electricity. 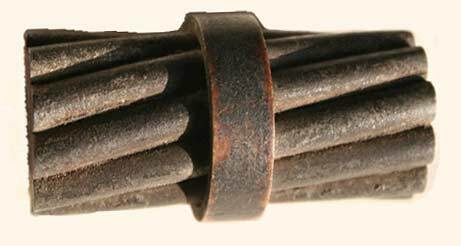 The Exploder was a crank-operated magneto-generator using six small horseshoe magnets and six soft iron armatures rotating on a brass axis, weighing thirty-two pounds, in a wooden case that weighed an additional seven pounds. 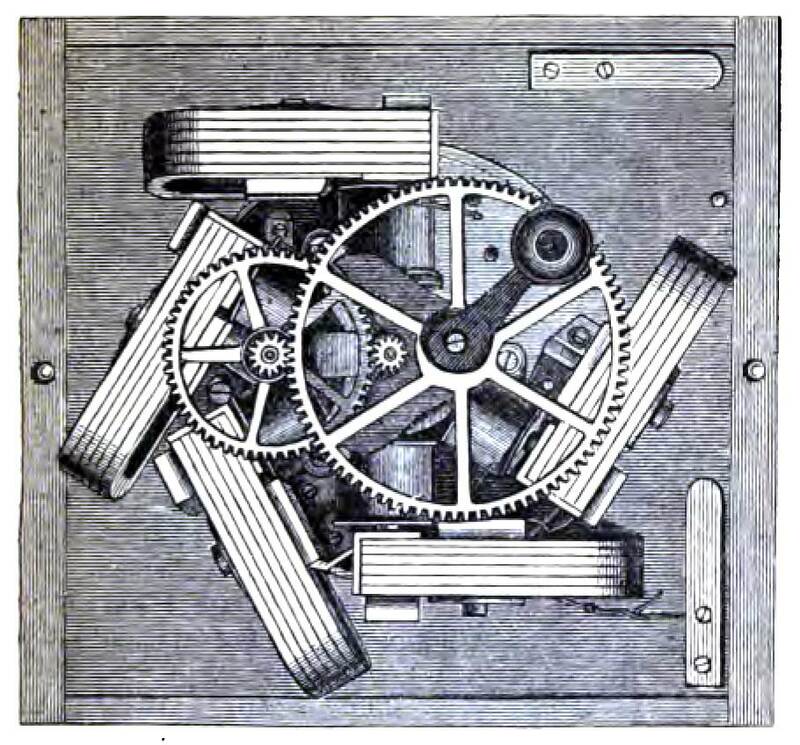 This earliest blasting machine could simultaneously ignite from two to twenty-five black powder or gun-cotton charges in tin cases or india-rubber bags over 600 yards distance with a single insulated wire. 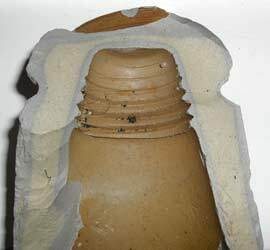 Up to four submarine charges in india-rubber bags could also be detonated at one time. The Magnetic Exploder was widely used in colonial mining and was adopted in 1863 by the military in Britain . It was also imported into the Confederate States in 1864 from Reid Brothers to detonate submarine mines. Latterly Reid Brothers made the common pull-push blasting machine, patented by Henry Julius Smith of New Jersey in 1878. 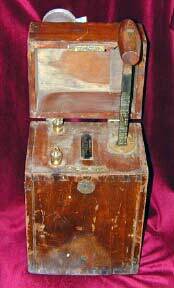 In his initial patent Smith carefully gave Wheatstone credit for his electro-magnetic machine. 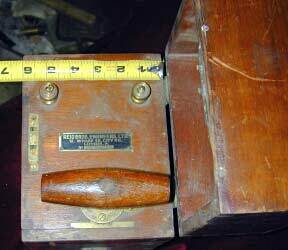 Reid’s blasting machines to Smith’s pattern were used at least until the Great War. These images of a late-model Reid Brothers blasting box were provided by Texas MacDonald, who obtained the machine from a friend who had been a trapper, outfitter and prospector in Northern Ontario, Canada. 12, Wharf Rd. City Rd.